Implements a platform-independent thread management class. Constructor. 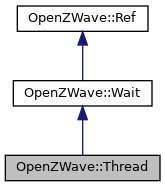 Creates a thread object that can be used to serialize access to a shared resource. Destructor. Destroys the Thread object. Used by the Wait class to test whether the thread has been completed. Causes the thread to sleep for the specified number of milliseconds. _millisecs Number of milliseconds to sleep. Start running a function on this thread. Attempts to start a function running on this thread. The call will fail if another function is already running. _pThreadProc pointer to the function to be run. The function must take a single void pointer as its only argument, and return void. On entry, the pointer will be set to the context provided to this Start method. _context pointer allowing any relevant data to be passed to the thread function. True if the function was successfully started. Stop a function running on this thread. Attempts to stop a function running on this thread. The call will fail if no function is running. True if the function was successfully stopped.